Designing a floral recipe with Casey was the epitome of perfection. This honestly may be my favorite floral recipe to date. She knew she wanted something beachy with white, blush and pops of black to coordinate with her bridesmaid dresses. As soon as she mentioned pops of black, I showed her a picture of an anemone and she fell in love! This flower became the inspiration for the entire look and it turned out more beautiful than we could have imagined. 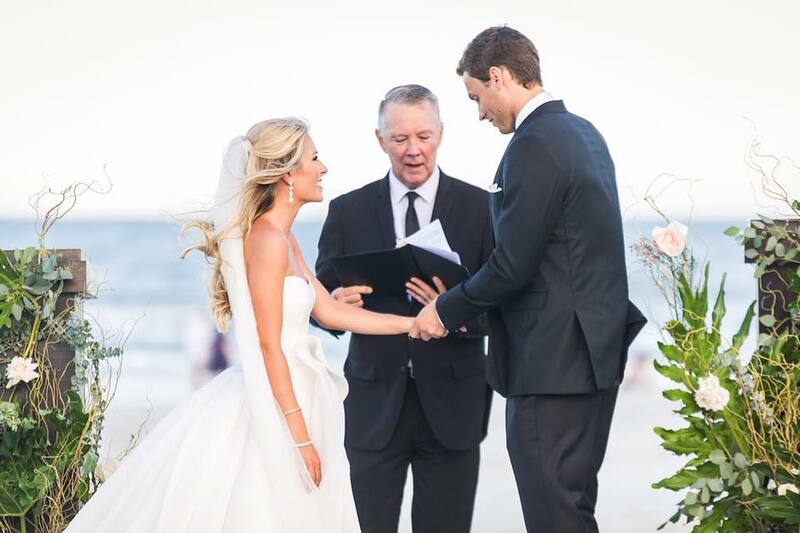 Every detail of her wedding was stunning and everything you could dream of for a beach wedding. From the gorgeous cake created by her grandmother, to the xanadu foliage she hand picked from her friends yard, each design was sentimental. One of my very favorite details about their wedding was the corsages. They were show stoppers. Gold cuffs adorned with anemone and spray roses and eucalyptus tucked underneath is what the mother's and grandmothers wore for the special event. I literally still dream about them!